How can Flip the Fleet more effectively encourage people to buy EVs? Flip the Fleet can best increase EV uptake by placing positive and authoritative messages in a wide variety of media. A continuous mix of the numbers and personal stories of EV owners will work best. More recruits are needed to improve the project’s reach and effectiveness, especially if more tools and presentation material are provided to the members to communicate the results in their own networks and communities. Supporting car dealers and targeting messages to the auto-magazines will be helpful, but really the scale of barriers to EV uptake means we need to use all methods to reach diverse audiences. There is ample evidence that Flip the Fleet is already building confidence amongst prospective buyers and EV owners – we mainly just need to help each other to keep on going as hard and fast as we can. The poll was sent to 798 participants in Flip the Fleet on 25 May 2018. There were 429 responses by 4 June, 312 of which provided detailed comments and answers to 6 other questions, including the question analysed here. Respondents were invited to specify details if they chose ‘Other’. This report also incorporates the relevant comments to the final question in the survey – “What have we missed?” – and invitation to offer broad responses to the flip the fleet programme and how to improve it. 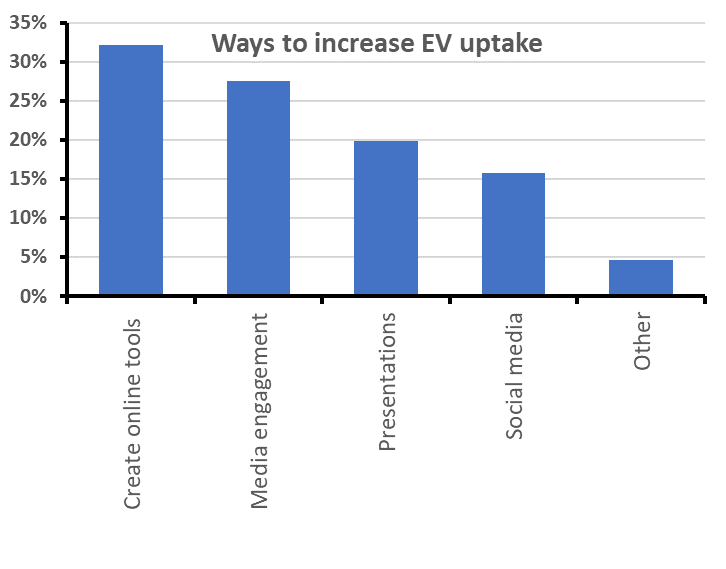 Participants thought the creation of online tools to showcase the benefits of EVs was best bet for increasing EV uptake (32%). Using TV, radio and print media for increased engagement also received good support (28%), but social media wasn’t thought to be as effective (16%). One in five of you thought giving more presentations to wider audiences will up EV purchases (20%), with the remaining 5% having Other ideas. 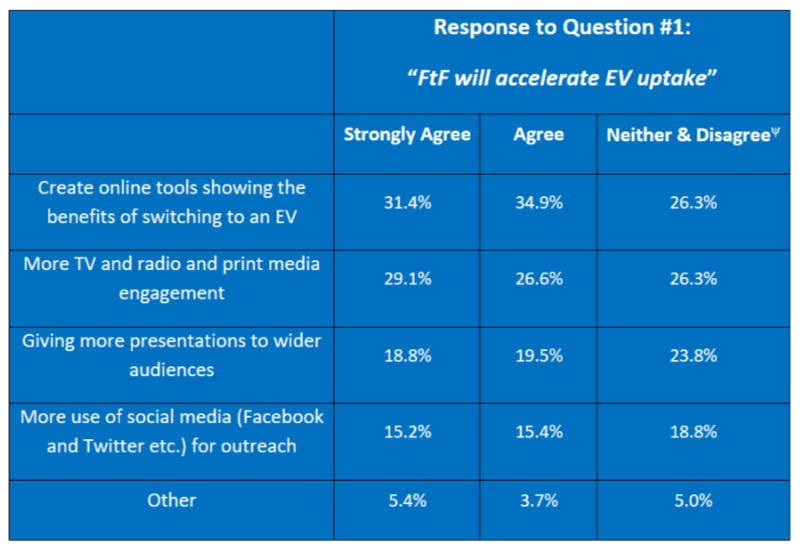 There was no sign that potential ways to improve Flip the Fleet’s effectiveness were correlated with the respondent’s overall confidence that the project will accelerate EV uptake (Table 1). Figure 1. Percent of 544 choices by 312 participants in a survey of how Flip the Fleet could increase the probability of other people buying EVs, May-June 2018. Table 1: Responses to questions about the most valuable components and future improvements of Flip the Fleet’s services differentiated between responses that “Strongly agree”, “Agree” or “Neither agree nor disagree” of ‘Disagree” that Flip the Fleet will accelerate EV uptake. Choices are arranged in order from most frequent to least frequent across all responses to Question#1. 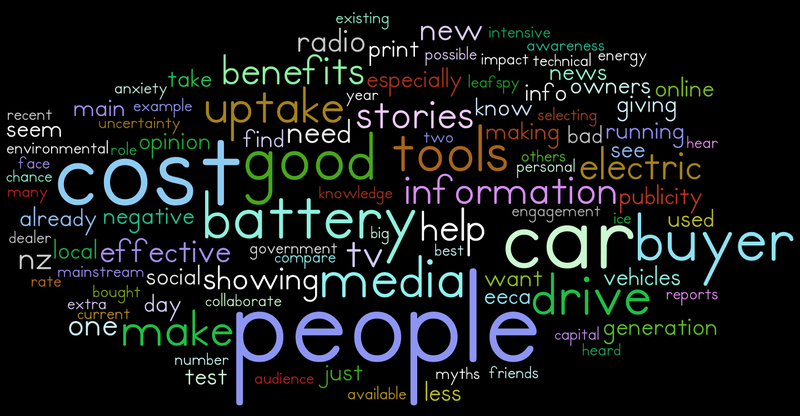 Here’s a word cloud of the comments you provided to the question about how to increase the probability of people buying EVs, using the ‘Wordle’ package: the larger the font, the more times that word appeared in your testimony (Fig. 2). You emphasised people, cost and the buyers, as well as the value of information. And for the first time in the survey, the role of media and stories played a prominent role. Figure 2. A word cloud of the most frequent 100 words used in your responses to the outreach question of the survey. The larger the word, the more often you mentioned it. Similar words were combined for this analysis to give a better indication of the language used and it’s intent. For example, “cost” encompasses costs, “tool” is grouped with tools, and “buyers” includes buying. Common words such as “EV”, “Flip the Fleet”, “Leaf”, “like”, “perhaps”, and “maybe” as well as “i.e.”, “e.g.”, and “etc.” were removed. We take pride in the fact that “people” sit at the centre of the Flip the Fleet project, so it’s great to see us all shining through in this Wordle! But, yikes, the word “cost” is also there with possible positive and negative connotations. Several of your people-related comments mentioned the need to firstly decide exactly who we should be encouraging to buy an EV, or indeed who can afford to buy one, and letting this direct the type of media used to engage and promote potential buyers. Many of you identified the mainstream media as the first and main exposure to the possibility of going electric. Bold opinions swayed heavily towards TV, radio and print media: “While EVs have a reputation for being expensive (though, I don’t think so for equivalent aged cars), it’ll be the older generation who can afford them (hence my clicking TV, radio, and print media)”. But not everyone think we can trust the media: “I have a pretty poor opinion of NZ journalism so I give more weight to presentations than to engagement with TV, radio and print media”. Several of you expressed your frustration with some influential and poorly informed media commentators. Examples included: “There is a lot of misinformation out there about the cost of running EV vehicles”; “Mainstream media and politicians (e.g. Jami-Lee Ross) are still full of misinformation and negative commentary on EVs. Needs to be combatted”; “I’m a Radio NZ National listener and I still hear arrant nonsense from some commentators on segments like The Panel and elsewhere”. In light of this, perhaps at least some EV promotional material should be devoted to “Target the most common, stubborn myths about EVs and their environmental impact, lifetime CO2 emissions, costs etc.”, or else we take a more direct approach: It would be great to make contact with Jesse Mulligan or Kathryn Ryan again and give them an update on the number of EVs registered, the number of owners hooked up to FTF and the sorts of savings we’re collectively making. Maybe a chance to address some widely-held misconceptions about EVs too”. Even if the mainstream media is the main gateway to flag the EV option, it’s clear that other ways follow to build the confidence of people to actually switch. The social media networks may work for some but not others e.g. “First of all, people need to learn [that they have an EV option]. Social media are too poisonous, and online tools are the second or even third step. Thus traditional media and engaging with people directly seem to be the most effective tools to me at this stage”. Others thought that: “Children and young adults are more open to new ideas than busy parents” which perhaps leans more towards the use of social media. Another participant noted: “Raising EV’s in public awareness is going to improve uptake, and social media is the cost effective, contemporary way to share stories”. An additional and novel idea included the use of an EV influencer: “Get buy-in from a local recognised personality who drives an EV – then communicate an interview with him / her”. There was also general support for word-of-mouth promotion. This is where “people” and “information” came together, with the suggestion to arm EV owners with simple yet effective information and let them take it from there! “Making the information available to existing EV owners is key, because EV uptake is spreading largely through personal connections”. Several actual examples of this in action were reported: “When one of my friends heard I bought a PHEV, he enquired, I gave him what I knew, next week he has a Leaf”. A key stakeholder, influencer and communicator in the whole chain is the car dealer. Some of you urged us to “Increase awareness at a dealer level”, and “Maybe (create) some links through EV sellers – pamphlets in each car?”. Some Flip the Fleet members are even willing to spread the word beyond a casual chat or timely encounter, with a suggestion that we make available: “a presentation that can be used by other EV enthusiasts to present at functions like Rotary and Lions”. Now there’s an idea! A smart presentation with speaker’s notes can be delivered by a dispersed army of EVers who then can add their own personal testimony to the bones of the presentation that features our collective data. There’s also the extremely personal interaction of test driving cars. A bit of admin required, and no doubt a trailer load of trust, but “In my experience, it is the test drive that sells EVs. It’s the stories that get people to take a test drive”. The Better NZ Trust organise the Leading the Charge events with funding help from the government to do this very effectively. The testimonials speak for themselves: “my brother drove my Leaf once, for thirty minutes, and two weeks later bought his own, as a direct result of the test drive (and intensive online research, admittedly)”. Another said “I just keep letting people drive my car”. So partly we just need to get bums in drivers’ seats to capture their hearts and back-up with the facts and figures to fill in their heads afterwards! Some of you emphasised a division of effort between providing general messages and providing useful customised information and tools for prospective buyers. For example, one of you advised us to “Focus on allowing people to identify what is normal for a car that they might be interested in (e.g., they’ve seen a 2013 Leaf at a dealer and want to know if it is a good buy, what the SOH should be etc.). Big picture stuff on buying EVs is unlikely to be helpful”. Compare that with a broader: “Focus on touting the environmental and social benefits more than information on car efficiency, which as of yet, is outside the scope of the membership”. Now what about the elephant in the room? The capital “cost” associated with EV purchase is, as you well know, an investment repaid in future savings. But not everyone is able to take the initial financial knock to reap the later rewards. Some think it’s only a matter of time before this barrier is broken down, stating that: “the younger generation may be more convinced as ranges and their resources grow, making having an EV as the MAIN family vehicle more viable”. Others see a way to fast track EV uptake through subsidising vehicles and improving battery longevity: “Cost is the primary driver for this market, no subsidies means low uptake until prices come down, and extra publicity won’t help. The big issues are technical – battery management and especially, battery replacement”. Apart from the opinion that EVs currently sit outside many household budgets, the word “cost” did also branch into the cost savings EV ownership makes available. We received many comments about how to use this to promote ownership through the all-powerful comparison approach: “Compare EV vs ICE running costs, but include the full life cycle costs for a unit of energy!”. One participant thinks: “we need a calculator based on our data where a person can enter their own annual travel distance and current car or its consumption rate so the computer can predict how much money they’ll save by selling their current dunger, and what the payback time might be compared to buying a newer ICE machine”. It’s not all about the money. You’d also like to see the cost-effective running of an EV paired with supplementary information about the many other positive aspects: “More published reports showing the benefits to owners and to society as a whole from the adoption of electric vehicles”. Others think that the limited number of EV models available in NZ is slowing the flow: “..of course the main reason for less uptake is the price and that the most popular choice of car is not supported locally”. use of more comparative data to convince potential buyers e.g. “Some sort of analysis showing the pattern of existing car use in NZ and the extent to which this can be done with an EV. Maybe broken down into usage groups with percentage of commuting, local run-a-round, long distance”. We all know we are up against a real challenge to get most New Zealanders into EVs. Plenty of your messages referred to the need for us all to just keep on going e.g. “Keep it coming”; “Keep up the awesome work”; “Keep sending data”; “Keep sending reminders”; “Keep the feedback coming”. In view of the scale of the challenge, many of you are urging an “everything goes” approach to spread the EV net widely. For example, one of you said: “Not sure [which method is best], but anything that increases publicity must help. I’ve had my Leaf for a year, and only just heard about Flip the Fleet by chance”. And another remedied: “Gosh, all of the above”. We agree our core task is to mobilise “Anyway that can make EV ownership more mainstream”. Others are urging more careful targeting and adjusting the method and the messages accordingly: e.g. get to the kids – they are more open, even if it will be a while before they are the decision-makers. Older folk may not be as trusting of social media and much less likely to use it. Some of you identified the dealers as a key group for carrying Flip the Fleet’s messages onwards. A recent study in Europe had actors approach dealers and recorded their subconscious or conscious efforts to talk potential customers out of buying EVs (http://www.anthropocenemagazine.org/2018/05/glib-car-dealers-are-a-major-obstacle-to-ev-adoption/.) Is this also happening in NZ? We see many wonderfully committed and well-informed EV dealers, some of whom contribute to EV Facebook groups. But maybe we should be directing our information to the other dealers who don’t share our confidence in EVs? How can we best bring the other’s around? We were really pleased to discover an EV dealer in Christchurch has printed out Flip the Fleet’s infographics for display around their show room (they are all available for download and use at https://flipthefleet.org/resources/infographics/. There is also a large number of specialist automobile magazines that could play important roles in reaching the traditional car lovers. Finding the people that are interested in cars for their own sake is half the battle, so we should perhaps try to develop specialised EV columns or EV journalists to work those channels. Quite apart from who we target, which barriers we try to erode, and what methods we use to spread the word, we must pay attention to the tone of our communication and to make the messages near continuous and non-threatening. One of you put it this way: “If you shout at people (“EVs are best”) they will recoil. If you keep a continuous feed showing people, especially influential people, enjoying them, people will start to want to join the club”. Finding the appropriate tone for the messaging is difficult. You have emphasised that the credibility and therefore the trust in Flip the Fleet’s evidence comes from telling the bad along with the good (https://flipthefleet.org/2018/1-click-survey-19/). But we also need to remain positive-minded and show solutions wherever and whenever we can. For example, some people feel we didn’t finish the response to the Nissan 30kW battery very well e.g. You’ve told us why we should be depressed, now tell us what we can do about it!”. Of course, we would love to have been able to do that, but it is not altogether clear what can be done yet. For others, even the bad news is worth having if it raises hope that a solution will eventually be found e.g. “As I have a 30k battery, keep up the good work there”. Encourage test drives – you’ve gotta drive them to feel them! Find a way to make Flip the Fleet sustainable, and never, ever give up. What does your big picture diagnosis of Flip the Fleet look like? Phew! This brings us to the end of the additional 1-click survey questions in the May survey that we have transformed into blogs (take a look at the main 1-click survey that started this chain off by clicking https://flipthefleet.org/2018/1-click-survey-19/.). What you most valued and most want next were described at https://flipthefleet.org/2018/what-do-flip-the-fleet-participants-find-most-useful/ . And then we followed the money at https://flipthefleet.org/2018/funding-flip-the-fleet-to-keep-it-sustainable/ . All up you dumped over 1500 nuggets of advice, encouragement and the occasional brick bat into our laps. It seems we really are making a difference. With Flip the Fleet data readily available, people “just need to show others and they are amazed at how much we have saved so far”, whilst others “have mentioned it as a source of data to put buyers’ minds at rest”. Many of you are now “more aware of how to look after my battery”, and are becoming real EV champions using FtF to fuel the EV movement: “I link to some resources from the website for people asking questions about EV ownership (predominantly Leaf ownership) on Facebook EV groups I am a member of”. It’s always good to end on high notes, so here are a few encouraging comments to round out the series. We can rest assured, knowing: “The data have come in handy for some strident debates among mates”, and that people are: “excited to know that Flip the Fleet will help establish EV’s in New Zealand and the world”. Others really do “like being part of the EV community, and Flip the Fleet is a hub for that community”. Some have encouraged us to: “Keep up the awesome work”, and it’s quite amazing how a “thanks for all you are doing” here, and confirmation that we “do a great job” there raises the team’s energy and determination levels. We certainly at times need and receive motivation to “Just keep on doing what you are doing!”, while collectively you’ve suggested heaps of ways that we can all work smarter. “Thanks guys (which is not meant to be gender specific LOL) for all your dedicated hard work”. And wow, who said “I sing your praises loud and clear to all interested in getting an EV so they have unbiased information” … we’d like to buy you a drink. Yell EVees from the treetops! Get bums in drivers’ seats! EVs are attractive to older women drivers because they provide worry free motoring with no engine maintenance. Therefore it is important that EV rapid chargers are in safe locations. I felt very unsafe and lonely in the Gordon road dannevirke location late yesterday afternoon, Sunday 24 June. There are no amenities within walking distance for me and nobody was there to help me if the 3 youths who were hanging around attacked me. Ladies, avoid this place and keep safe.